IRF: What are some of the flagship solutions you are presenting at the Global Road Conference & Expo? Deck Top Scanning System (DTSS) is a vehicle-mounted camera system that captures both infrared (IR) thermography and high resolution (HR) visual images at highway speeds. It can estimate what area of a bridge deck needs repair and determine whether in-depth measures should be implemented. DTSS already satisfies major requirements and recommendations laid out by the Federal Highway Administration (FHWA), Federal Transit Administration (FTA), American Association of State Highway and Transportation Officials (AASHTO) element condition inspection, and the state’s Department of Transportation (DOT). SmartEAGLE is an advanced Roadway scanning vehicle that is equipped with a 3D laser mapping system, a line camera system, and a line sensor able to record georeferenced 3D visual data at highway speeds. It is the ultimate crack-detection machine. It uses the International Roughness Index, required by the FHWA, which was developed by the United States National Cooperative Highway Research Program (NCHRP) and the World Bank. Tunnel Scanning System (TSS) combines three imaging systems: IR thermography, HR visual imagery, and 360-degree imaging to provide a comprehensive structural deficiency analysis of tunnels. Compared to a hands-on inspection of an entire tunnel (or tunnel system), one pass with the tunnel scanner can pick out places of concern and save considerable man hours. By mounting the system on a proper vehicle, it can scan railway tunnels, road tunnels, or cable tunnels. IRF: What mobility challenges do they address? 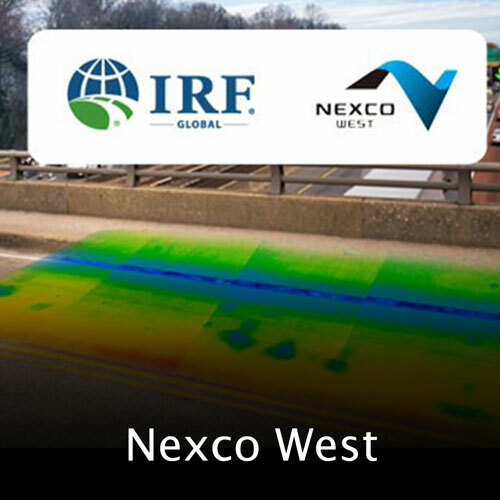 NW: NEXCO-West USA’s Inspection Technology combines visual and Infrared imaging systems to generate a dual image of a structure. This combination provides a comprehensive display of superficial cracks and subsurface delaminations that allows for data-driven, objective decision making for structural maintenance. The operating speeds of our mobile systems (10 - 70mph) rule out the necessity of lane closures even in times of heavy traffic. Our stationery systems provide virtual access to the sub-structures regardless of its location (over water and/or above ground). The analyzing process is conducted off-site, allowing for a reduction of about 20-30% of labor time and money, as well as an increase in safety for the inspectors. The deficiency map delivered provides the total area in need of repair to accurately estimate total cost for rehabilitation bids.